To help take some of the sting out of tax day, many restaurants and other businesses are offering tax day discounts and freebies. Some of the deals are only valid on April 15; others are good before and after. Applebee’s: Applebee’s is serving the Strawberry Dollarita with Twizzlers, to get you through the numbers crunching. Bruegger’s Bagels: You’ll have to join Bruegger’s Inner Circle to get this deal. Get the Big Bagel Bundle (13 New York-style bagels with two tubs of cream cheese) for $10.40. California Tortilla: Taxes, Schmaxes! Free chips and queso with any purchase on April 15. Chili’s: This offer is not just for Tax Day, but for the entire month of April. Get the Straw-Eddy Rita for $5. 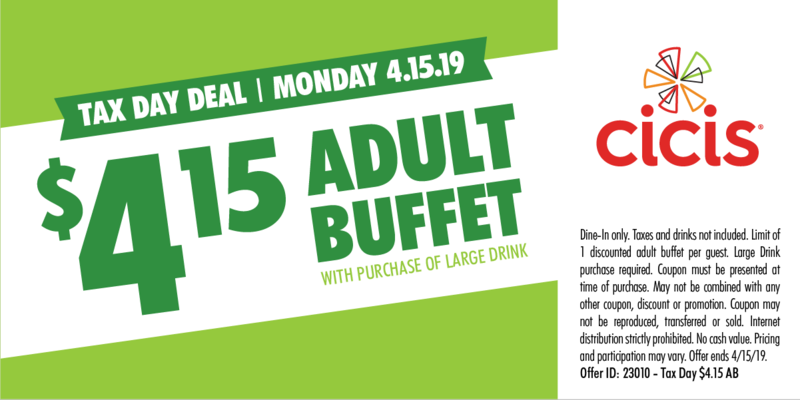 Cici’s: Get an adult buffet for $4.15 on Tax Day, April 15, with the purchase of a large drink. You will need this coupon. Dunkin’ : Dunkin’ (Dunkin Donuts) is offering its DD Perks® Rewards Members a Medium Hot or Iced Coffee for $1 all day, Monday, April 15 at participating Dunkin’ restaurants. 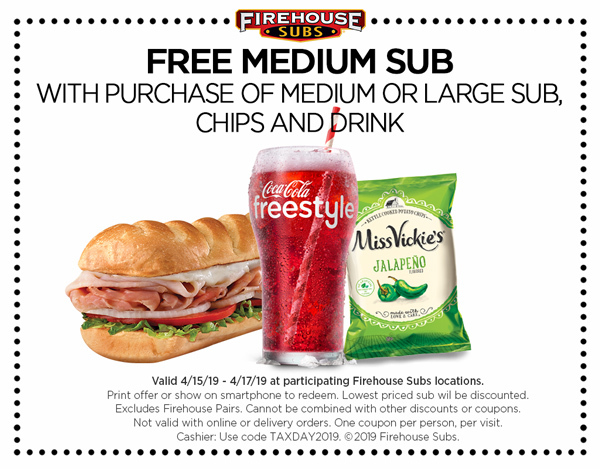 Firehouse Subs: FREE medium sub when you purchase an additional medium or large sub, chips and a medium drink. You will need this Firehouse Subs coupon to get the deal. The offer is valid Monday April 15 through Wednesday April 17. Great American Cookies: Get a FREE original chocolate chip cookie on April 15. Limit one per guest. Hardee’s: Get a free sausage biscuit on Tax Day, April 15. Say “made from scratch”at participating Hardee’s locations from 7 am to 10 am on April 15. Hot Dog on a Stick: FREE Original Turkey Dog or Veggie Dog at participating locations. No coupon required. No purchase or proof of completed taxes necessary. Hooters: Kids at free on April 12 to 15, 2019 with a $15 adult purchase at participating Hooters locations. Find the nearest restaurant near you here. HydroMassage: Get a FREE massage (April 15-22). You’ll need to call ahead for an appointment (except for Planet Fitness locations) and you’ll need this coupon. Noodles & Company: $4 off any online or mobile app order of $10 or more. The deal is valid from April 10 to April 15. You must be signed up for NoodlesREWARDS by April 9 in order to receive the offer. Schlotsky’s: Get a free small The Original with the purchase of a medium drink and chips. Tony Roma’s: Visit Tony Roma’s until April 28 to try out their new Hits with a Twist menu. Copyright Living on the Cheap. The post Tax day freebies and deals appeared first on Living On The Cheap.